1. Airlines have different types of ticket fares with different terms and conditions. You should check these terms and conditions and the respective restrictions before choosing the type of ticket. Most airlines have a website that provides information on the conditions of carriage, which generally describes the obligation of the airline and that of the passenger. For example, under what circumstances and how much of ticket price will or will not be refunded, items that will be charged extra, etc. 2. When comparing the ticket prices of different airlines, consider the total price of the ticket, which includes all applicable taxes, fees, charges and surcharges. Please take note that some Low Cost Carriers may add to the headline price for items such as baggage and meals while conventional airlines do not. 3. Double-check the booking details (flight date, time, passenger's name, etc.) before confirming the booking. Once a ticket is confirmed or issued, airlines usually impose additional charges when changes are requested, depending on the type of ticket. 4. The procurement of an air ticket normally means the establishment of an air transportation contract between a passenger and the airline. Both have their rights and duties outlined in the terms and conditions of the ticket. You should read these terms and conditions carefully before purchasing the ticket. 1. The ticket price usually consists of taxes, fees, charges and surcharges where applicable. Price details should be displayed by airlines during the booking process. 2.Common taxes, fees, charges and surcharges for passengers departing from Hong Kong International Airport include HKSAR Air Passenger Departure Tax, carrier surcharges and any charges collected from the destination airport. 3. Each airline has its own fees and charges stipulated in the terms and conditions. For instance, some airlines impose extra charges on hold baggage, sports equipment and musical instruments. 1. A code share flight is one operated by an airline and simultaneously marketed by itself and another airline each under its own flight numbers. Sometimes a single flight may be marketed by two or three airlines where it will simultaneously be sold with the distinctive flight numbers of those airlines. Airlines have the responsibility to inform their passengers when the flight they are selling is operated by another airline. 2. It is important to know whose terms and conditions will apply when your flight is operated as a code share flight since your rights in case of flight delay and cancellation, baggage allowance, etc. may vary with different terms and conditions of different airlines. Please contact your agent or airline concerned direct for details. Whenever you are booking a ticket, it is important to note the terms and conditions provided in the airlines website. If the information is considered not sufficient or if you are in doubt, always seek clarification from the airline concerned. Please contact your airline concerned direct for details. As a passenger, it is an offence under the Air Navigation (Hong Kong) Order 1995 (Cap. 448C) to take dangerous goods (except for certain dangerous goods in very small quantity and in special condition) on board an aircraft. The law restricts the type and quantity of dangerous goods allowed to be carried by passengers, because they can be a danger to you and the aircraft in flight due to temperature and pressure difference. Other dangerous goods e.g. magnetised or radioactive material, toxic or infectious substance like diagnostic samples, chemical. There are other unlisted forbidden dangerous goods. Please follow airline instructions. *Alcoholic beverages in retail packagings containing no more than 70 % alcohol by volume, total quantity must not exceed 5 L.
* If these items are carried in cabin baggage or on one's person, please observe the "Restrictions on carriage of Liquids, Gels, Aerosols (LAG) in cabin baggage"
If you are not sure if an item can be taken onboard aircrafts, please contact your airline. Many dangerous goods can be shipped as cargo if properly prepared and declared. For further information, please contact your airline. 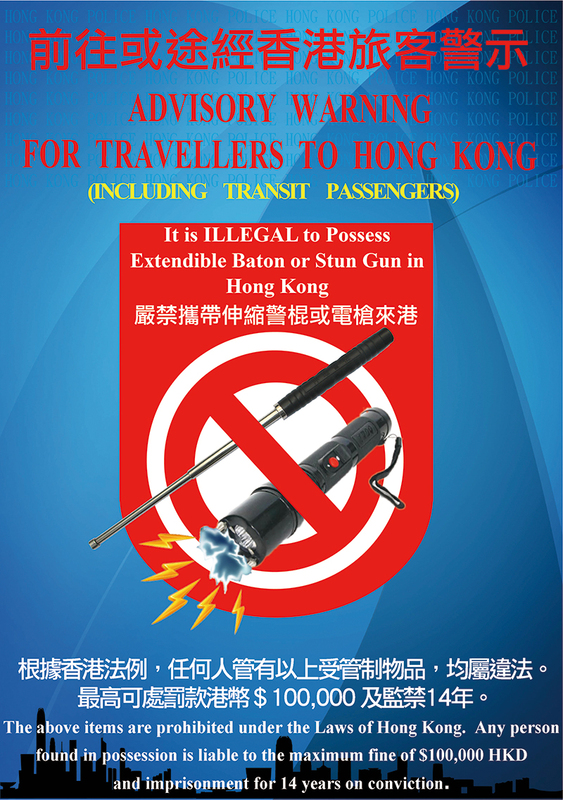 Apart from the restrictions on carriage of baggage as shown on this page, air passengers shall also observe other requirements relating to the possession of restricted items, such as stun gun, within the territory of Hong Kong. For details please visit the Hong Kong Police Force's webpage: Advice to Visitors. Please note the examples on the above list are not exhaustive in nature. Some airlines and destination / transit countries may also have additional requirements on carriage of security restricted items by passengers. Passengers are advised to contact relevant airline and authorities for further details and assistance. 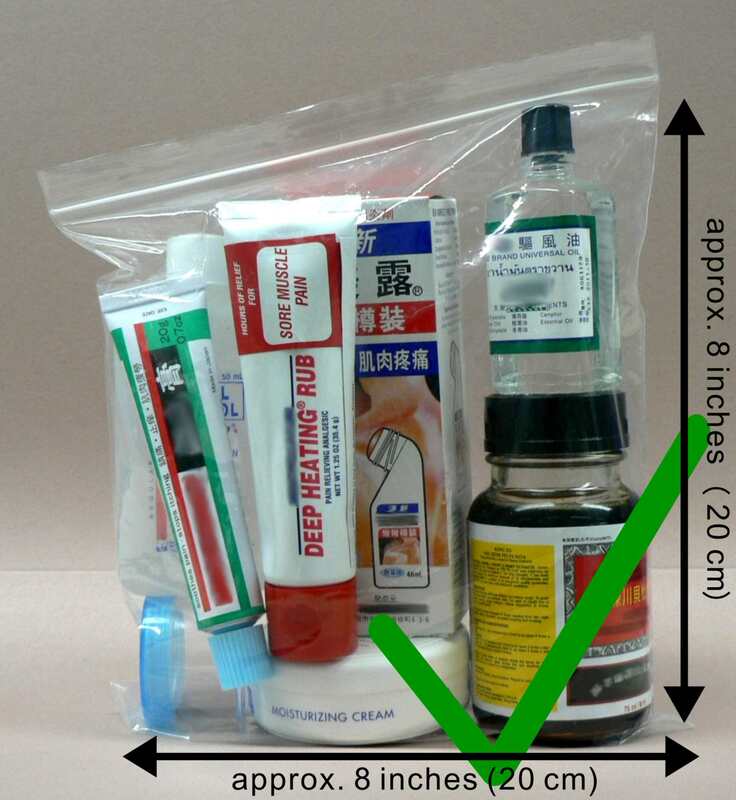 The Hong Kong International Airport (HKIA) has implemented security measures for screening liquids, gels and aerosol starting from March 21, 2007 to comply with the guidelines of the International Civil Aviation Organisation. 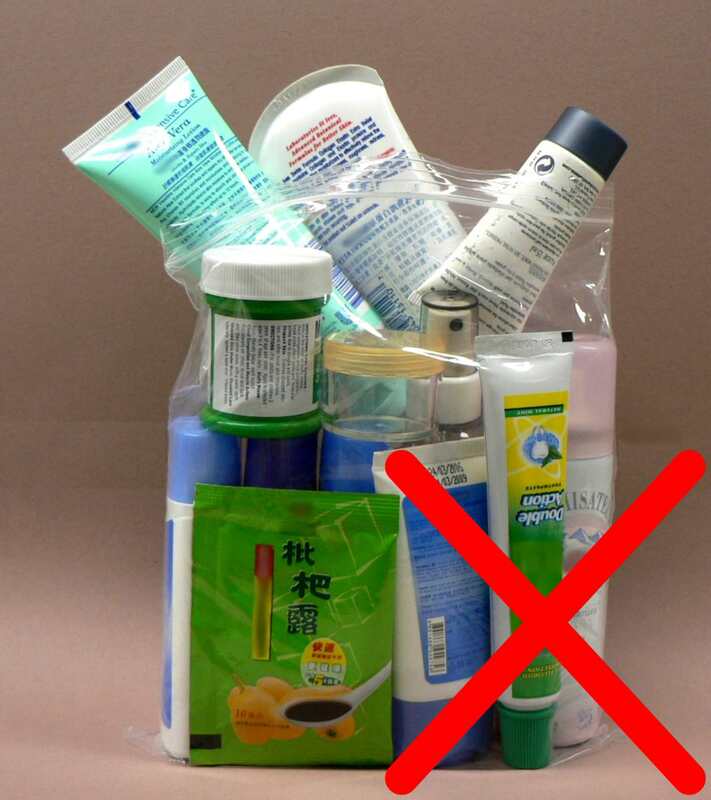 All liquids, gels, aerosols in cabin baggage have to be carried in containers with a capacity not greater than 100 ml. 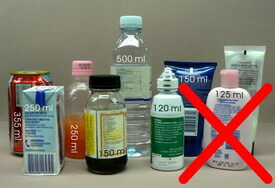 Liquids, gels, aerosols carried in containers larger than 100 ml will not be accepted, even if the container is only part-filled. Containers have to be placed in a transparent re-sealable plastic bag of a maximum capacity not exceeding one litre. The containers must fit comfortably within the transparent plastic bag, which should be completely closed. 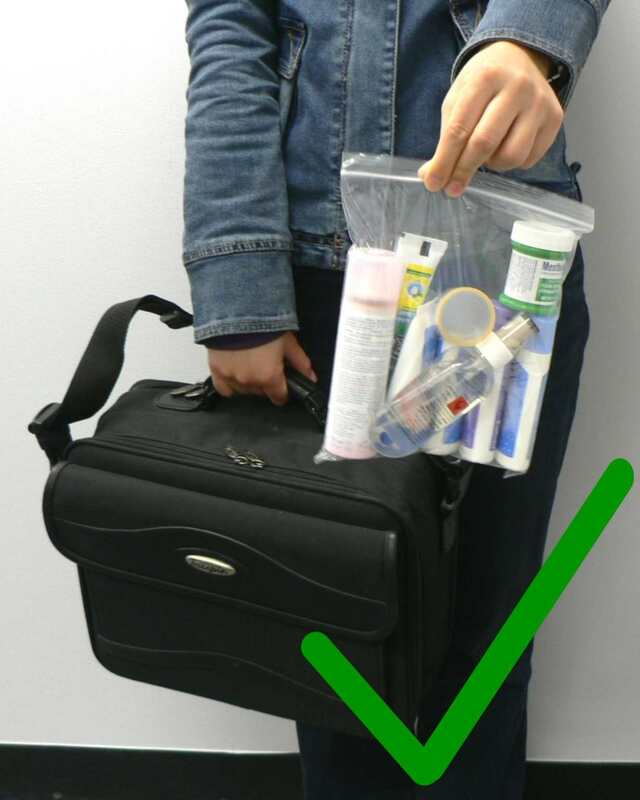 The plastic bag has to be presented separately from other cabin baggage for visual examination at the screening point. Only one transparent plastic bag per passenger is permitted. Exemptions will be made for medications, baby milk / food and special dietary requirements subject to verification. 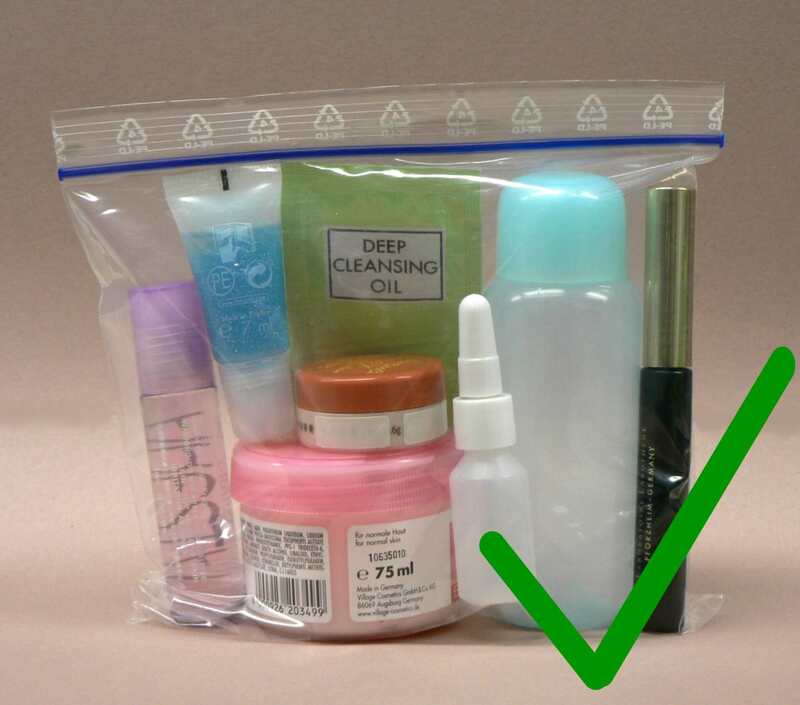 For frequently asked questions regarding the restrictions on the carriage of liquids, gels and aerosols cabin baggage, please click here. In view of the potential risk of the smartphone concerned and the latest requirements of the Federal Aviation Administration of the United States announced on October 14, 2016 (US time), the CAD has requested all airlines operating flights to and from Hong Kong to remind passengers not to transport the device on passenger flights to or from Hong Kong in carry-on baggage or in checked baggage. Checked Baggage# Passenger must remove the lithium battery from the smart luggage and carry the removed battery in the carry-on baggage. Carry-on Baggage# The lithium battery from the smart luggage must be removable. If the battery cannot be removed, the luggage will not be permitted for carriage as checked or carry-on baggage. Based on the IATA guidance, individual airlines are introducing new requirements and restrictions on the subject. Passengers are advised to contact their airline concerned before departure should they have any query about the requirements and restrictions applicable to the carriage of smart luggage. Air passengers will have to pay the Air Passenger Departure Tax when they buy air ticket from the airlines, travel agents or helicopter companies. Airlines normally will not collect departure tax at the check-in counter unless it has not been collected upon issue of air tickets. Under the Air Passenger Departure Tax Ordinance (Cap. 140), passengers who have paid Air Passenger Departure Tax upon purchase of air tickets but eventually have not departed from Hong Kong by air are eligible for full refund of tax paid. They are required to apply tax refund from the airlines, travel agents or helicopter companies, and no charge shall be payable for such refund. The Civil Aviation Department has prepared a set of guidelines on refund arrangements of Air Passenger Departure Tax for airlines' reference. Sea-to-air passengers (passengers who arrive at Hong Kong International Airport by cross boundary ferry service for onward departure from Hong Kong by air). With effect from 26 April 2005, same day cash refund of advance payment of departure tax is available at the Sky Pier at Hong Kong International Airport. Passengers who have been issued Refund Coupons upon check-in at the cross boundary ferry pier but have not collected the refund at the Sky Pier Refund Counter on the same day of travel shall contact the airlines concerned directly for the refund. Passengers who have not been issued Refund Coupons can apply by post only (please refer to the following paragraph (ii. b.) for the application procedures) to the Civil Aviation Department for tax refund. 4. relevant documents to support of the claim to exemption. As it takes time to process refund applications at the counter, passengers should allow sufficient time for the refund applications after check-in. If the passenger has difficulty in depositing the Hong Kong dollar cheque in his / her bank account, please refer to Note (ii) of "Air Passenger Departure Tax (APDT) Application for Refund" form for alternative payment arrangements. (c) writing to: Revenue Section, Finance Division, Civil Aviation Department, Level 5, Office Building, Civil Aviation Department Headquarters, 1 Tung Fai Road, Hong Kong International Airport, Lantau, Hong Kong.